The fruitbodies develop just below the surface of the soil and emerge as they expand. 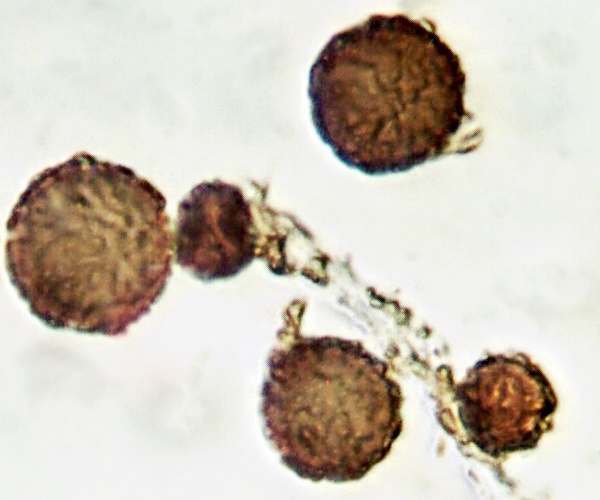 If you cut through a young fruitbody the interior (gleba) is white, but it gradually turns into a brown powdery mass as the spores mature. 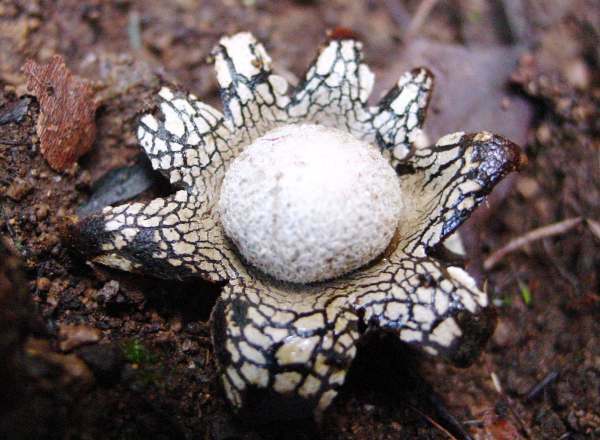 The rays of this intriguing gasteromycete fungus open and close, but unlike flower petals which respond to sunlight the rays formed from the outer peridium of this earthstar react to the moisture content of the air and the soil on which they grow.. The upper and lower surface of the rays expand and contract differentially. In very dry weather the upper layer contracts most and so closes the rays over the spore sac, protecting it from being eaten by snails or other predators. In wet weather the rays open and expose an apical tear in the inner peridium (the spore sac) via which a fine stream of spores is released and carried away on the wind. The animation shown here was made by taking a dry Barometer Earthstar and dousing it in water, which gradually permeated the outer peridial rays. The rays then opened out gradually. A sequence of still photographs taken over a 45-minute period was then turned into an animated gif. 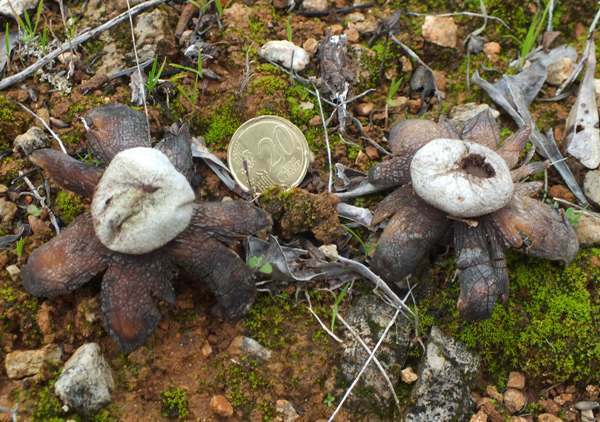 A rare find in Britain, where most records come from southern England, the Barometer Earthstar has not been officially recorded from Ireland or Scotland. 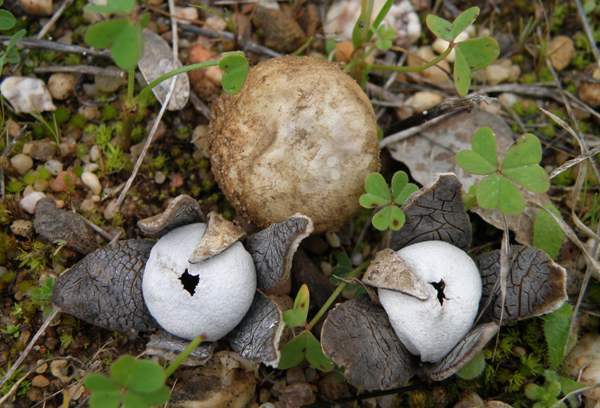 On mainland Europe this relative of the boletes and earthballs is most common in Mediterranean countries; I see it very frequently in the Algarve region of southern Portugal. 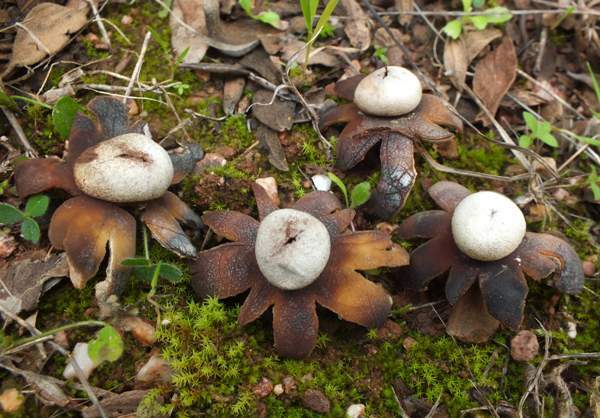 The Barometer Earthstar was described scientifically in 1801 by Christiaan Hendrik Persoon, who placed it with the other 'earthstars' in the genus Geastrum as Geastrum hygrometricum. In 1889 the American mycologist Andrew Price Morgan (1836 - 1907) transferred this species to the genus Astraeus, thereby establishing its currently-accepted scientific name as Astraeus hygrometricus. 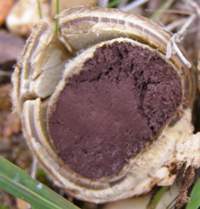 Synonyms of Astraeus hygrometricus include Lycoperdon stellatus Scop., Geastrum hygrometricum Pers., Geastrum vulgaris Corda, and Astraeus stellatus (Scop.) E. Fisch. In Greek mythology Astraeus, one of the Titans, was the god of dusk (when the stars come out). Astraeus married Eos, goddess of the dawn, and among their children were the four winds and the five planets of our sun known to exist at that time but considered to be 'wandering stars'. The specific epithet hygrometricus means 'water measurer', a reference to the way the rays of this earthstar respond to changes in atmospheric humidity in much the same way that a barometer responds to fluctuations in atmospheric pressure. The outer layer of the peridium varies from ochre through tan to mid brown and as the fruitbody matures this outer layer splits into 6 to 15 pointed rays which are fairly flexible when moist by tough and leathery in dry weather. Often, but not always, the upper (inner) surface of the rays is covered in an attractive network of dark cracks on a paler background. 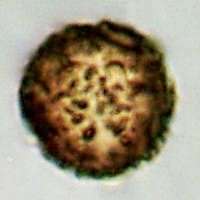 The grey spore sac is between 1 and 3cm across and is a slightly vertically-flattened spheroid with a thin papery skin. Astraeus hygrometricus develops an apical tear (an irregular slit rather than the regular round hole via which spores emerge from Geastrum species), and in wet and windy weather ideal for spore distribution the rays of this earthstar arch downwards and raise the bulb a little higher from the ground. Even such a small increase in elevation can make a big difference in terms of wind strength, and so spore dispersion becomes much more effective. Immature specimens have a 'mushroomy' odour when cut open. Ectomycorrhizal, found under trees - oaks in particular - generally on sandy soil. Fruiting after rain in late summer and autumn; visible all year round. 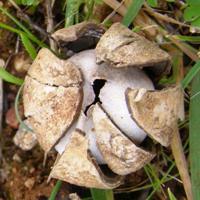 Several of the Geastrum species are of the same general form, and confident identification requires a lot of expertise. 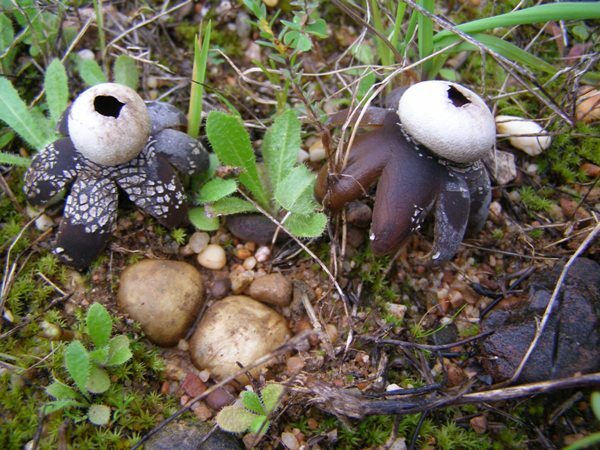 Astraeus hygrometricus is generally considered inedible and to have no culinary value (although other Astraeus species are reportedly eaten in parts of Asia); however, when dried Barometer Earthstars can make attractive table decorations as long as they do not get mistaken for pepper shakers!. Ellis JB, Ellis MB. (1990). Fungi without Gills (Hymenomycetes and Gasteromycetes): an Identification Handbook. Chapman & Hall. Pegler, D.N., Laessoe, T. & Spooner, B.M (1995). British Puffballs, Earthstars and Stinkhorns. Royal Botanic Gardens, Kew.